How can I get and keep clients? How can I bring in more fundraising dollars? How can I get people to remember me? Our corporate clients come to us for ideas to solve challenges and change client or employee behaviors. 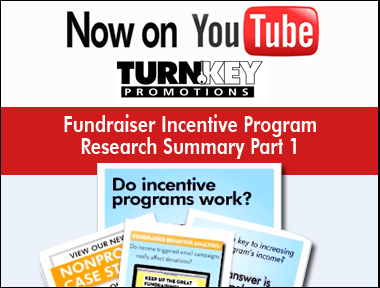 Our nonprofit clients ask, "How can I make zero dollar fundraisers into fundraising machines?" They are interested in our incentive program research and proven method for increasing event income and lowering administrative costs. Tell us what you need to accomplish. We're ready to solve your challenges too. The Life Cycle of Volunteer-Driven Fundraising Events. Just posted: You Want WHAT? Bless Your Little Heart. "Spray the Cat or Trash the Couch?" You decide! It's the latest blog by Katrina VanHuss. Branded Versus Non-Branded Fundraising Gifts. Which is Better?